A swivel blade Piranha Peeler from Kuhn Rikon. Prevent slipping and sliding with the added teeth on the specialized blade. Instead of gliding over the surface, or slipping around, the sharp bite of this blade digs in slightly to improve performance. Fuzzy fruits like peaches, or slippery foods like tomatoes are quickly skinned without any prep or special steps necessary. The swiveling blade will slide and pivot to conform to rounded shapes, and it has teeth on both sides, so it works in either direction, and can be used in your right or left hand. The skinnier handle is slightly curved, and coated in a rubber material to create a comfortable and ergonomic tool. Use side to side, or peel from back to front. This tool is easily adaptable to any peeling style, and the lightweight construction reduces strain without affecting durability. Dishwasher safe, and complete with a hanging hole so you can store it in a drawer, or on a hook. Super Sharp. High quality steel creates a durable blade that is incredibly sharp. Serrated. Instead of a smooth finish, this blade has little teeth to improve performance on certain foods. Avoid Blanching. Get straight to peeling without frustration thanks to the extra grip and peeling power provided. Ergonomic. The non-slip handle has added rubber material for comfort, and a slight curve to make it more ergonomic. Effortless operation. Ambidextrous. Works for right or left handed people without modification or adjustment. Also works for regular stuff too. As with any peeling tool, using this one is pretty simple and straight forward. The curvy handle makes it nice to hold, and the swivel blade allows it to conform to rounded foods. If your regular peeler is making things difficult, then try this one to decrease effort and annoyance. It works like most others, but follow the steps below for optimal performance. Hold the tool in your dominant hand, and support your food with the other hand. Position the blade on top of your produce, and apply downward pressure. Slight pressure will allow the teeth to break the skin to prevent slipping. Use a pulling motion to peel, and work from top to bottom, or front to back. Always pull away from your body for safety. Continue peeling until the desired amount of skin has been eliminated. The swivel blade will pivot to conform to rounded surfaces. Food pieces will drop straight down, so work over a sink, bowl or trash can for collection. Prefer a different handle style? Kuhn Rikon also makes this tool with a y-shaped grip. 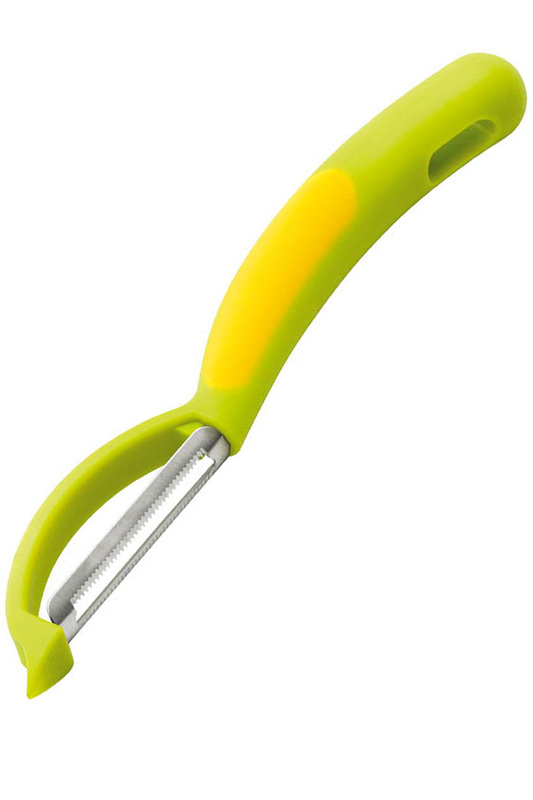 For a different blade orientation, and a design some people prefer, check out the Piranha Y Peeler. Like your tools made from metal? We also carry the Star Serrated Peeler, and it has a steel blade and handle. Uses Peeling fuzzy or slippery produce. Swivel design to make round shapes easier to work with. The sharp blade has added teeth to make smooth or fuzzy fruits easier to peel. Order Yours Today.